The Emperor’s a smallish hotel but well designed, with delightful rooms priced at a level making it a great year-round deal. A lot of thought has clearly gone into the hotel and the result is a cosy rather than cramped feel. It’s a new building though the modern exterior belies a somewhat retro-style interior where varnished wood and red carpets make it seem as if you’ve stepped into a posh colonial club. Space is at a premium though they do manage to squeeze in a small but cute outdoor seating area downstairs next to the in-house restaurant. Unusually, they haven’t gone up high, with only three storeys plus a rooftop seating area for dry season. As the hotel is located near the moat and palace area, a few high buildings do obstruct its views. The position is relatively handy for some of Mandalay’s sights, and not too bad for some of the restaurants either. Rooms themselves are attractively finished and could grace a boutique-style hotel with much higher prices. They’re neither huge nor too small, and varnished wood panelling extends even to ceilings in the larger superior versions. Additional decor, including a few local flourishes, is kept simple, and the result is comfortable and cosy. Being new, all furnishings and fittings are in good condition and air-con and hot water work well. They manage to fit in tables and a couple of cane chairs and some superior rooms come with small balconies. Bathrooms are simple but clean; superiors have tubs. We had to do a double take when they told us room rates; with only a modest high season supplement, the Emperor is a top deal at any time of year. If you’re on a low budget, it’s worth a few bucks extra to splash out on, and if you usually go midrange it’s also worth lowering your sights to. The only problem is that with a limited number of rooms, availability will be an issue, so book ahead if you can. 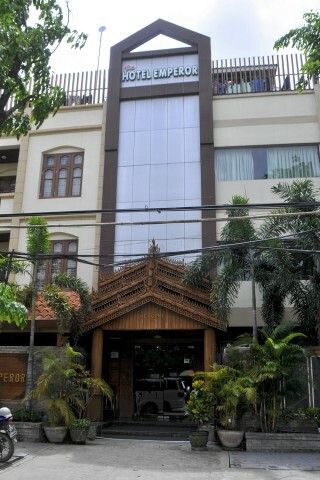 Check rates at Hotel Emperor on Booking.com.